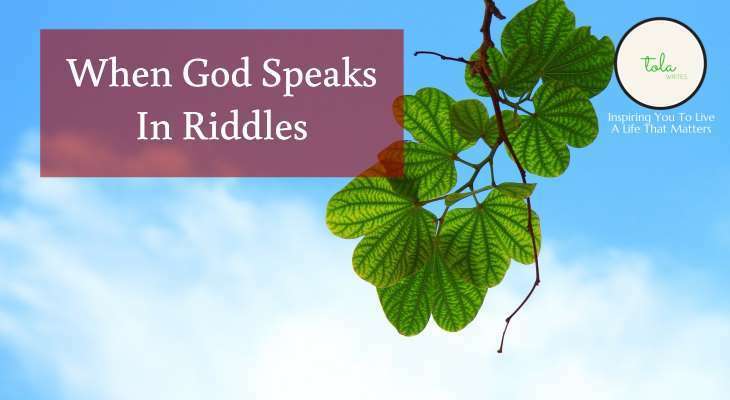 Are you one of those who thinks that God speaks more in riddles? Actually, “speaking in riddles” is a nice way of saying “it seems God is not getting it”. Well, the disciples must have thought the same thing at this moment. A messenger had made the long journey to find Jesus and give him a very urgent message. Mary and her sister Martha, great buddies with Jesus, told Him that his good friend Lazarus was very sick. Jesus doesn’t go with the messenger. But he assures that the sickness will not lead to death. He decides to spend a few more extra days. I bet the disciples would have thought – no problem, he’s already said Lazarus was not dying from the sickness. Later on, Jesus tells them – our pal Lazarus has fallen asleep. I bet they were still thinking – he is not dying. I guess that’s why they responded, “if he sleeps, he will get better”. You think you completely understand what God means. And then you think you heard something completely the opposite of what you thought you heard. Is God out to have fun at our expense or is there something more to it than meets the eye? If you are familiar with Marvel Movies, you know a bit about Thor & his half-brother Loki. Well, for the uninformed, Loki specializes in mischief. Nothing is ever the way it seems with him. It’s like he is always working “an angle” every time. Even when he agrees to help out his brother on some daring adventure. It’s never straight with him. I guess for most of us, God is like Loki. He has a thing or two up His sleeves and we can’t know what angle He is working on. I would be remiss if I say that God works like logic. To reduce Him to logic would be to reduce His godliness. But if God doesn’t work by logic, can you trust God? Well, you can trust God to act like God. So, what does it mean to act like God? What does it mean to be God? Well, God will act first as foremost in His best interest. To be God means, you can self-focused without been self-conceited. You are self-existing – you make yourself to exist without needing anyone to make you or create you. You are self-sustaining – you don’t need anyone or anything for anything. You give yourself everything you need and everything you need is inside you. These are a few of the attributes that make God, God. But if He doesn’t need anything outside Himself, why does He need to make things work in His best interest? Transcendence means God is far above and is on a level that is beyond what we understand, feel or touch. Immanence means that God comes down to a level we can feel, touch and understand. Omniscience means that God has all-knowledge and knows all things. If we combine these three together, we understand why God always acts in His best interest. Because He exists on a level beyond (transcendence) what we can understand, feel or touch, He is able to see and understand more than we can. And seeing that He has all knowledge (Omniscience) and can understand (Immanence) things on our level, His best interests will always work out for our best interest. I bet this must have been what Paul understood when he wrote this. There is this story about St. Teresa of Ávila. In January of the last year of her life, 1582, she left Ávila to establish convents in Burgos and Grenada. Well, it was a difficult journey. At some point, she had an accident that made her cry out to God. With her usual loving familiarity, she said: “Oh, my Lord, when will you stop scattering obstacles on our way”. To which God responded to her “Don’t complain, daughter. For this is how I treat my friends”. “Ah Lord, this is why you have so few friends” was her reply. God’s best interest for us may not always take us through the Easy street. But His best interests is the medicine for our greatest good. God speaks in riddles because we may not get the full picture if He told us everything from the start. The riddles are not to confuse us but to mature us. He is always acting in our best interests when He acts in His best interests. Behind all the riddles that Jesus ran with His disciples, He had their best interest in mind. And there you have it – God’s best interest was working out the disciples’ best interests. And I know that is also the same thing for you. God’s best interest will always work out in your best interest.